Ishikawa Optics & Arts and Inosyo have independently developed techniques for illuminating the interior of buildings that reduce the reliance on electric lighting [subscription link]. Harking back to Victorian drives to light interiors without electricity, Inosyo’s new skylight system funnels natural light from a glass dome on the roof through mirrored tubes and into any room. The result is ceiling fittings that are as effective as fluorescent lights. Ishikawa’s Solbene system is even more directly related to the Luxfer Prism glass made famous by Frank Lloyd Wright. The 2008 version uses 1cm glass prisms sandwiched between glass plates to refract exterior sunlight into dark building interiors. Around 70 per cent of light hitting the glass is directed towards the ceiling of the room, while 20 per cent shines on the floor, replicating a standard electric lighting effect. 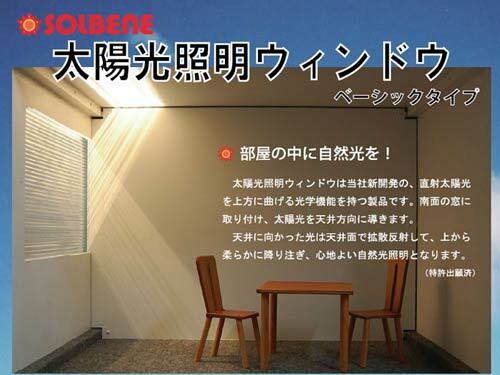 Although a Solbene installation for a 10 square meter room costs ¥500,000 ($4,800), the savings in electricity bills for large complexes such as factories could make it both economical and environmentally friendly.